Two years ago, Amina Rajan was constantly exhausted. It seemed that nothing she tried could boost her energy level. The cause of her fatigue turned out to be iron deficiency anaemia, a condition that affects some 2 billion people, according to the World Health Organization. The public health agency's website notes that "iron deficiency is the most common and widespread nutritional disorder in the world," and is especially prevalent among women and children. Iron is the mineral that gives blood its red colour and is needed to produce hemoglobin, which transports oxygen throughout the body. 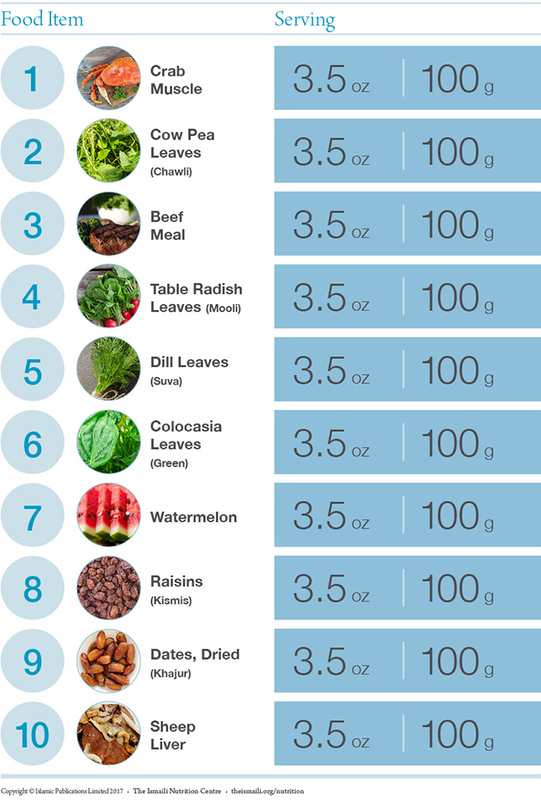 Without sufficient levels of iron, the body lacks oxygen and struggles to carry out basic daily activities. The most common symptoms of anemia are fatigue and an inability to focus. Gradually, one’s performance begins to decline and judgments become impaired. Other symptoms of the condition include spoon shaped or scooped nails, breathlessness, loss of consciousness, an irregular heartbeat, headaches, and dizziness. "I would need to put my head down on my desk at work because I wasn't able to stay upright anymore, and felt queasy and dizzy," she adds. Anyone with low iron levels can suffer from such symptoms, but the condition affects women the most. Those between the ages of 15 and 49 are at highest risk due to blood loss from menstruation, and an increase in demand for blood supply during pregnancy and breastfeeding. Vegetarians as well as older adults, who may struggle to obtain enough iron in their diet, can also be at risk. Those with malabsorption issues, such as celiac disease and colitis are another high risk group. Living with iron deficiency anemia can make it difficult to do heavy work for long periods, as Amina explains: "I was only able to do the bare minimum. Finally, I couldn't manage the work anymore and had to take time off. At that time I stayed in bed and rested for several weeks." Some pregnant women may develop iron deficiency anaemia. In severe cases that are left untreated, it can increase the risk of complications such as preterm delivery (baby is born before 37 weeks) and the risk of low birth weight (baby is born weighing less than 2.5 kilograms). The World Health Organization notes that anaemia contributes to 20 per cent of all maternal deaths. For some, the treatment of iron deficiency anaemia involves taking iron supplements alongside dietary changes to boost the intake of iron-rich foods. These steps can help restore the missing iron, and were what Amina’s doctor advised. Many factors influence our food intake: individual preference, availability and accessibility, social, environmental and cultural factors — all of these shape what we eat. Additionally, the nutrients in foods can vary significantly because of environmental, genetic and processing influences. There are many sources of food that are rich in iron. 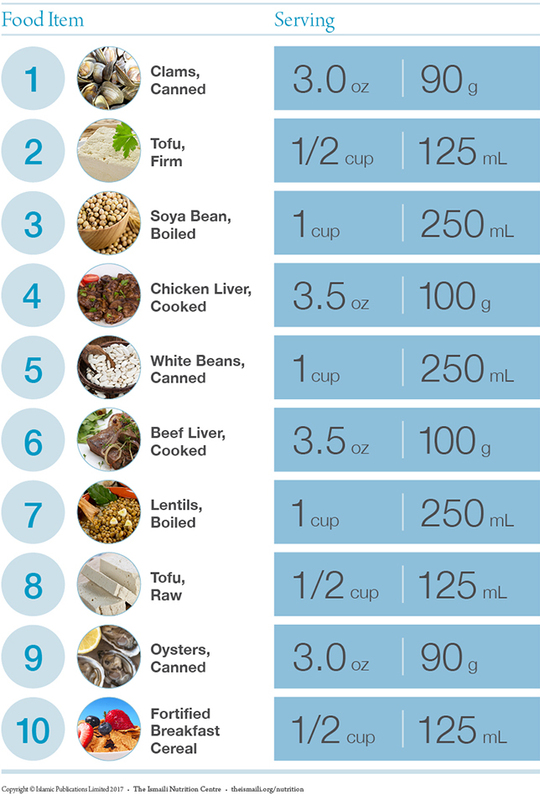 The two tables below highlight the top 10 iron-rich foods from the East and West. Does the form of iron in food matter? Two forms of iron exist in food: heme and non-heme. Heme iron, found in meat, fish and poultry, is easier for the body to absorb than non-heme iron, which is commonly found in dried beans, enriched and whole grains, as well as nuts, and some fruits and vegetables. Those who eat minimal or no meat must take in more iron from non-heme iron-rich plant foods and grains, but the absorption of non-heme iron can be enhanced with a sufficient intake of vitamin C.
There are also factors that inhibit iron absorption. Phytates, found in some legumes and cereals can decrease the absorption of non-heme iron. Tea, coffee, milk and dairy products also inhibit iron absorption. Eat your meal together with foods rich in vitamin C: peppers, guava, kiwi, oranges, amla, limes and many more. Sprout, ferment and cook cereals to reduce their phytate content. Avoid having tea, coffee, milk and dairy products with your meal as this can interfere with iron absorption. Consider using iron pots and pans to increase the iron content of your dishes. If you are experiencing any of the symptoms mentioned, please visit your doctor.